HMD Global yesterday announced the Nokia X71, a device bringing many novelties to Nokia smartphone lineup. The X71 has a punch-hole screen, a 48MP camera, coupled with an ultra wide-angle lens and depth sensor, and we also have the LED notification light inside the power button, which is nicely animated by the gif below the title that Nokia Mobile China posted on Weibo. Things strange about Nokia X71 launch was that the device was announced and launched only in Taiwan. Usually Nokia smartphones for Taiwan are members of the Android One program, but this device has Google apps, but isn’t an Android One phone. Nokia Mobile also didn’t announce availability in China or Chinese special administrative regions like Hong Kong and Macau. 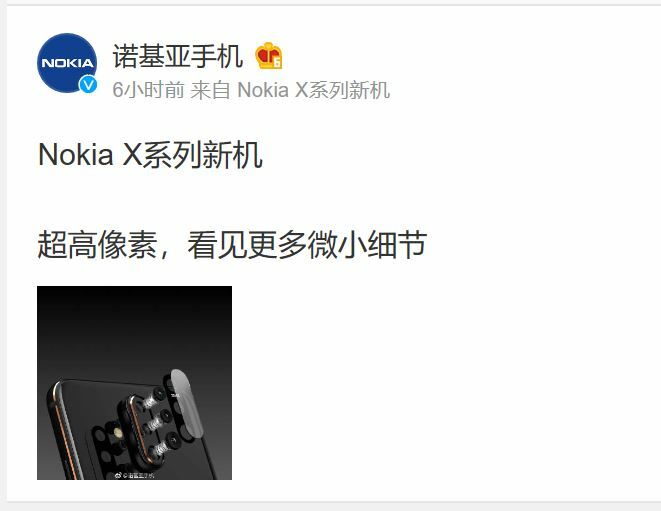 On Weibo, Nokia Mobile China started teasing the device with the already mentioned gif below the title and an image that shows the cameras. TheVerge reached out to HMD about availability, and the company responded that the X71 is an exclusive for Taiwan and China, meaning we will see the device in China too. Will Nokia X71 be available outside Taiwan and China? We don’t know. Usually phones that are First announced in China do later come to rest of the world. It will be interesting to see the global name of the phone if it goes outside China. The X7 in China is called Nokia 8.1 in Taiwan, so we might see HMD leaving Nokia X71 as Nokia X71, which would maybe be the best thing to do considering the device has some specs worse than the 8.1, has features the 8.1 doesn’t have and also is priced higher than the 8.1 in Taiwan (though 8.1 is 4/64, while X71 is 6/128GB memory configuration).